Every survey of late tells the same story about containers; organizations are not only adopting but embracing the technology. Most aren’t relying on containers with the same degree of criticality as hyperscale organizations. 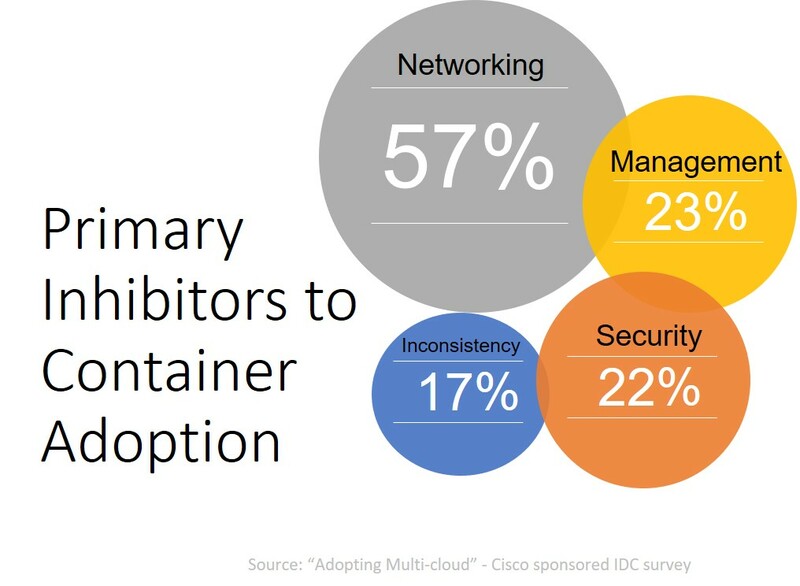 That means they are one of the 85% of organizations IDC found in a Cisco-sponsored survey of over 8000 enterprises are using containers in production. That sounds impressive, but the scale at which they use them is limited. In a Forrester report commissioned by Dell EMC, Intel, and Red Hat, 63% of enterprises using containers have more than 100 instances running. 82% expect to be doing the same by 2019. That’s a far cry from the hundreds of thousands in use by hyperscale technology companies. And though the adoption rate is high, that’s not to say that organizations haven’t dabbled with containers only to abandon the effort. As with any (newish) technology, challenges exist. At the top of the list for containers are suspects you know and love: networking and management. Some of the networking challenges are due to the functionality available in popular container orchestration environments like Kubernetes. Kubernetes supports microservices architectures through its service construct. This allows developers and operators to abstract the functionality of a set of pods and expose it as “a service” with access via a well-defined API. Kubernetes supports naming services as well as performing rudimentary layer 4 (TCP-based) load balancing. The problem with layer 4 (TCP-based) load balancing is its inability to interact with layer 7 (application and API layers). This is true for any layer 4 load balancing; it’s not something unique to containers and Kubernetes. 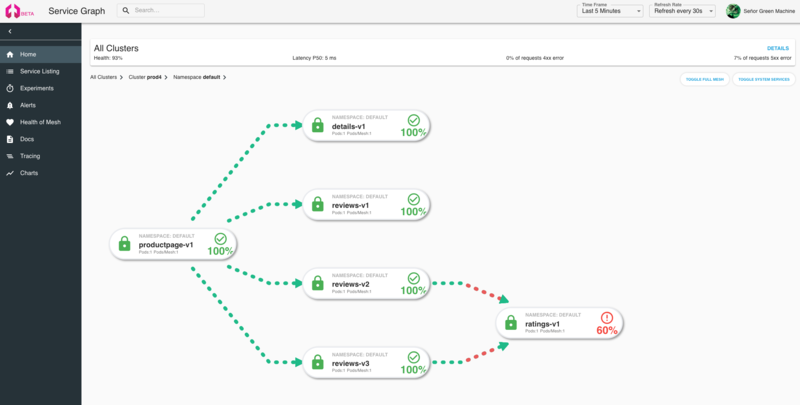 Layer 4 offers visibility into connection level (TCP) protocols and metrics, but nothing more. That makes it difficult (impossible, really) to address higher-order problems such as layer 7 metrics like requests or transactions per second and the ability to split traffic (route requests) based on path. It also means you can’t really do rate limiting at the API layer or support key capabilities like retries and circuit breaking. The lack of these capabilities drives developers to encode them into each microservice instead. That results in operational code being included with business logic. This should cause some amount of discomfort, as it clearly violates the principles of microservice design. It’s also expensive as it adds both architectural and technical debt to microservices. Then there’s management. While Kubernetes is especially adept at handling build and deploy challenges for containerized applications, it lacks key functionality needed to monitor and control microservice-based apps at runtime. Basic liveliness and health probes don’t provide the granularity of metrics or the traceability needed for developers and operators to quickly and efficiently diagnose issues during execution. And getting developers to instrument microservices to generate consistent metrics can be a significant challenge, especially when time constraints are putting pressure on them to deliver customer-driven features. These are two of the challenges a service mesh directly addresses: management and networking. Both are more easily addressed by the implementation of a service mesh as a set of sidecar proxies. By plugging directly into the container environment, sidecar proxies enable transparent networking capabilities and consistent instrumentation. Because all traffic is effectively routed through the sidecar proxy, it can automatically generate and feed the metrics you need to the rest of the mesh. This is incredibly valuable for those organizations that are deploying traditional applications in a container environment. Legacy applications are unlikely to be instrumented for a modern environment. The use of a service mesh and its sidecar proxy basis enable those applications to emit the right metrics without requiring code to be added/modified. It also means that you don’t have to spend your time reconciling different metrics being generated by a variety of runtime agents. You can rely on one source of truth – the service mesh – to generate a consistent set of metrics across all applications and microservices. Those metrics can include higher order data points that are fed into the mesh and enable more advanced networking to ensure fastest available responses to requests. Retry and circuit breaking is handled by the sidecar proxy in a service mesh, relieving the developer from the burden of introducing operational code into their microservices. Because the sidecar proxy is not constrained to layer 4 (TCP), it can support advanced message routing techniques that rely on access to layer 7 (application and API). Container orchestration is a good foundation, but enterprise organizations need more than just a good foundation. They need the ability to interact with services at the upper layers of the stack, where metrics and modern architectural patterns are implemented today. Both are best served by a service mesh. 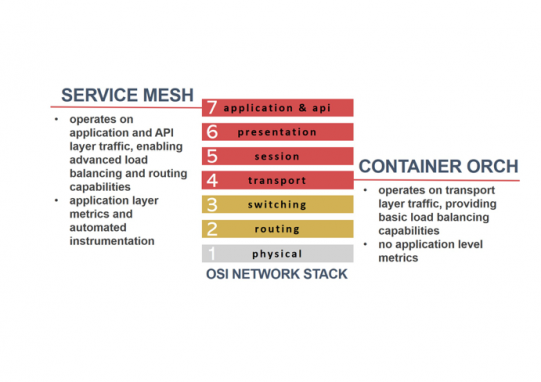 When you need to go beyond container orchestration, go service mesh.